HSBC Holdings Plc weren’t quite the swansong he’d hoped for as he hands the reins over to his long-term lieutenant, John Flint. 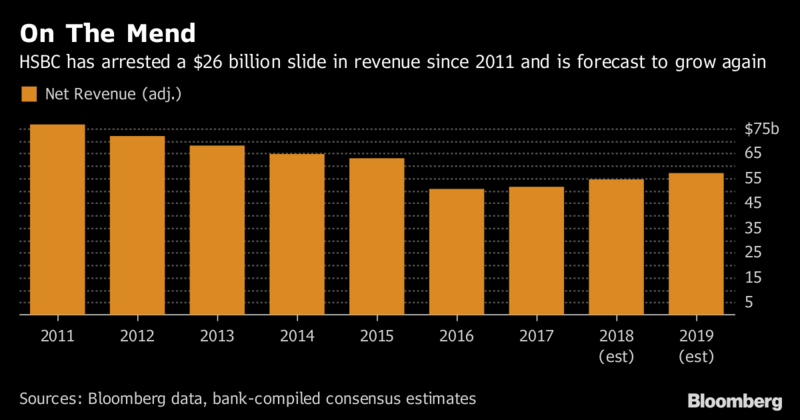 Europe’s largest bank missed estimates for fourth-quarter revenue and profit as it became the latest firm to take losses from two high-profile corporate failures and post a sharp decline in trading income at its investment bank. HSBC also said share buybacks were on hold, possibly through the first half, while it sells capital-boosting securities. 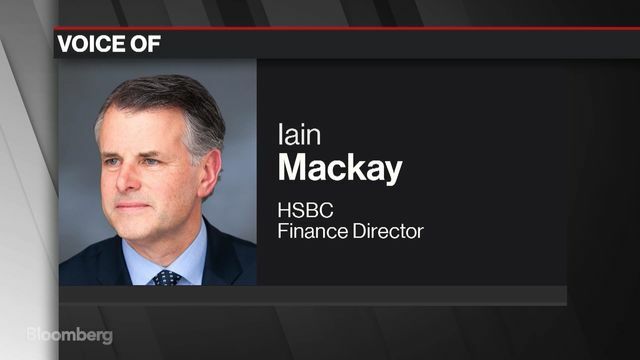 HSBC Finance Director Iain Mackay discusses the bank’s earnings and performance. Standard Life Aberdeen Plc, one of the bank’s top shareholders. HSBC is “firmly on the course set by Stuart and Douglas Flint with more to go for; it would be great if they get to a 10 percent return on equity from the current 5.9 percent,” referring to the industry’s measure of profitability. The shares fell 3.7 percent to 732.70 pence at 10:59 a.m. in London after its results earlier Tuesday. Flint, who takes over as chief executive officer on Wednesday, inherits an Asia-focused bank back in expansion mode after years of restructuring during which it lost more than $20 billion of revenue. After shrinking and imposing central control over the lender’s far-flung global network, while enduring several misconduct issues, investors are now looking for a return to growth. The last numbers are a blow to Gulliver after he managed to arrest a six-year slide in income over the course of last year and position the bank to return more cash to investors. Today was a rare miss for investors who’d gotten used to Gulliver beating profit estimates, at least in the latter part of his tenure. The outgoing CEO delivered higher-than-forecast adjusted net income in six of the previous seven quarters, according to data compiled by Bloomberg. The major culprit were loan impairments, which were about $188 million higher in the quarter than a year earlier, “largely driven by two individual corporate exposures in Europe,” HSBC said in the statement. The two companies responsible were Steinhoff International Holdings NV — the South African retailer engulfed in an accounting scandal and Carillion Plc, the U.K. construction company that imploded earlier early this year, a person familiar with the figures said, who asked not to be identified speaking about confidential data. The losses helped drive down adjusted pretax profit to $3.6 billion in the fourth quarter, undershooting the lowest estimate among five analysts surveyed by Bloomberg News. While revenue rose 10 percent to $12.4 billion, it failed to match the $12.7 billion analysts had expected. On a brighter note, HSBC’s strategy to redeploy $100 billion or more of assets to Asia continued to gather momentum. Fourth quarter profit rose 23 percent in the region and now accounts for more than three-quarters of earnings. That compares with a 29 percent decline in European profit. At the markets business, revenue fell 19 percent, driven by a 48 plunge in rates and a 24 percent drop in fixed income and currency trading. That was better than Wall Street peers that collectively posted a 30 percent drop in markets revenue in the final three months of the year. The bank also disclosed, on page 247 of its annual report, that various tax probes into Swiss private bank could cost the bank in excess of $1.5 billion. So far, it has provisioned $604m for related penalties and paid about 300 million euros ($370 million) to settle a criminal investigation by the French government into allegations it helped clients evade taxes. Like many other global financial firms, HSBC took a $1.29 billion hit from President Donald Trump’s changes to U.S. tax rules, but executives said the lower corporate tax rates should benefit the lender in the long-run. The firm’s common equity Tier 1 ratio fell to 14.5 percent from 14.6 percent at the end of September, yet remains above its target range of 12 percent to 13 percent. Analysts were also concerned that the bank’s net interest margin in the fourth quarter fell from a year earlier, which managers blamed on lower yields on customer lending and margin compression in Europe and Asia. The dividend was kept flat at 51 cents. Softening the blow for shareholders is the prospect of more cash being returned this year. Finance Director Iain Mackay said HSBC will look at buying back more shares as soon as the second quarter once it has completed a $5 billion to $7 billion debt issuance program. HSBC has repurchased $5.5 billion since mid-2016 and analysts at UBS Group AG forecast another $4 billion this year. Late in 2017, the bank managed to draw a line under its most high-profile scandal. In 2012, it paid a $1.9 billion penalty after being caught helping Mexican drug cartels launder money and breaching international sanctions on Iran. U.S. regulators said in December they would let the associated deferred prosecution agreement expire, removing the threat of a criminal conviction. The firm was also fined hundreds of millions of dollars for rigging foreign-exchange markets and benchmark interest rates around the world.